Nissan plans to use a rapid-reaction task force to troubleshoot possible customer complaints with its Leaf electric vehicle after its U.S. launch next month. 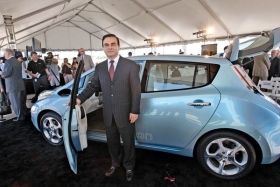 Nissan CEO Carlos Ghosn posed with the electric car last spring in Tennessee. ATSUGI, Japan -- Aiming to stamp out any glitches before they balloon, Nissan Motor Co. is setting up a rapid-reaction task force in the United States to troubleshoot possible customer complaints with its Leaf electric vehicle after its launch next month. The team of technicians, to be headed by about 10 lead engineers trained in the Leaf's battery-driven drivetrain, initially will be based in Los Angeles, Hitoshi Horie, manager of quality and customer satisfaction, told Automotive News today. The goal is to have technicians in place to visit customers and nip problems in the bud. Nissan is introducing similar task forces in Japan and Europe, where the Leaf also will go on sale. The Japanese carmaker's reputation is riding on the success of the electric vehicle, and the move is part of its efforts to ensure that the car's launch is as seamless as possible. “This is our first electric vehicle. The market must be properly prepared,” Horie said. Leaf components such as electric motors, inverters and lithium ion batteries represent new territory for engineers and repair people as well as the customer, he said. The Nissan task force concept echoes the Smart teams introduced by Toyota Motor Corp. this year in the United States to respond to customer complaints after that carmaker's recent rash of recalls. Horie said Nissan's iteration was inspired by due diligence, not Toyota. Under the lead engineers, the task force will have around 30 technicians, Horie said. The Leaf is seen as the centerpiece of Nissan's push to reshape its brand image into a leader in technology and the environment. Aside from wooing the public to a car that needs an electric plug instead of a gasoline pump, Nissan faces the challenge of convincing people that the Leaf's range of 100 miles on a single charge is good enough to get them through the day. To combat anxiety, Nissan is rolling out other special support services for the Leaf in Japan, such as a 24-hour emergency hotline, free towing, unlimited charging at dealerships and rental car discounts. The company is considering similar offers in the United States.